I have decided to join the WIPocalypse and GG Stitch-a-longs this year as it will guarantee (as long as I make each check-in) two posts a month. Plus they come with interesting questions and I had a lot of fun with Solo September last year. Check out Measi's blog for more information about the SAL and how to join. The question for the first check in is "Introduce yourself, your projects, and any goals you have for the year." My name is Rebekah and I am 23 years old living in Alberta, Canada. I live with my partner and our cat and am currently pursuing my Masters of welding engineering degree. Both myself and my partner graduated with a Materials engineering degree last April and he now works in the corrosion industry (cathodic protection). I am a few-at-a-time stitcher and do not have a significant stash although I have a long wishlist. The Kingfisher is a Stitching Studio design that was started in 2016. I have completed four of their other designs but this is the first Sue Coleman that I am doing. The piece is a mixture of full and half stitches with some backstitching. I have completed one and a half pages and plan to have this finished by the end of May 2017. 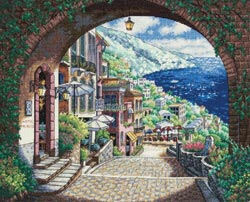 The Coastal view piece is a Dimensions kit that I won in a blog draw from Lucy. I have put in about 200 stitches already and will include a picture in my next post. I would like to have the piece at least half way completed by the end of 2017. 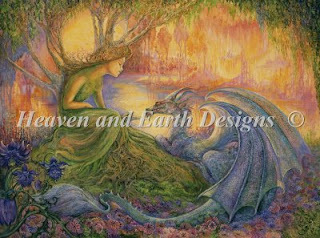 The Dryad and the Dragon is a Heaven and Earth chart by the artist Josephine Wall. I have three pages complete and would like to have at least six more done by the end of 2017. Hi Bekah! I've just found your blog and enjoyed seeing your wips very much. I really admire those of you stitching so many full-coverage pieces! I'm excited to see your progress on Coastal View- I have that kit in my stash.